Easy-to-Make and So Very Healthy! Spice and herbal teas make a lovely change from a regular drink and a cup of fresh ginger tea is no exception! Not only do you get the light lovely flavour, there are also a ton of health and well-being benefits! Although both the fresh root and pre-ground powder contain a wealth of healthy goodness, I only use the root for my drinks. Pour through a strainer and enjoy! Add some honey or agave if you like your drinks a bit sweeter. *I don't boil the root for long as this can destroy the essential oils and therefore some of the benefits. 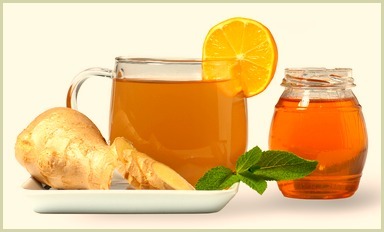 For one that uses peppermint and cinnamon, try this ginger tea recipe. For thousands of years folks have been making drinks with them. And you can be certain some culture somewhere will have a long tradition of brewing up a ginger infusion for a variety of illness and ailments. Click here to read more on the health benefits. Some More Spice and Herb Infusions You May Enjoy!